I like Myst, very much. I have done so since it was first released. A couple of years ago I started on a Myst Book of my own. The idea was that I bought an old book, had it rebound with paper that looked old, and then I'd write the story of my journeys through Myst in it. I have been working on it on and off for quite some time. The drawback of that approach was that I can't really show it to the Myst community unless I scan every page, which is technically hard. 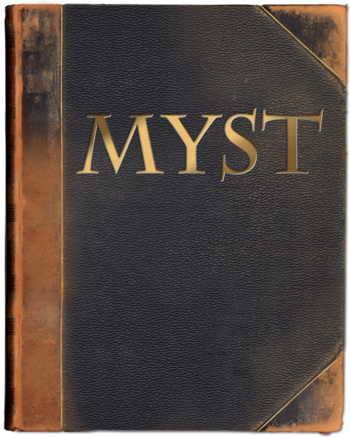 So I got the idea that I would also write a Digital Myst Book, and see which one is completed first. The digital version of the book started as a project at 2006-03-27. The idea is the same of course, but digitally I get the chance of working at a different pace both at work and at home, plus I can more easily produce online-viewable content. The process is, however, pretty much the same. 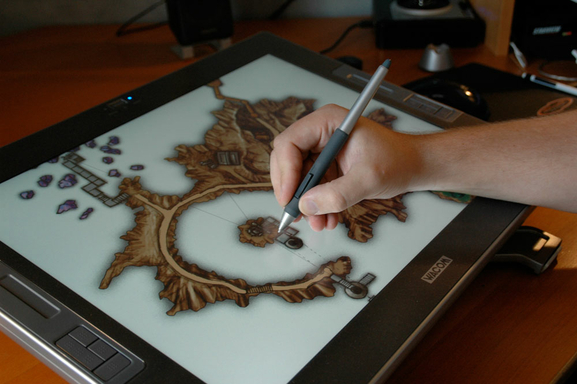 I own two Wacom Cintiq, one at home and one at work, so every illustration is still drawn by hand. I then use Adobe InDesign to create the layout of the actual book. I save that to a PDF file which I then convert into JPG images which are fed to a (regrettably) Flash file that makes the flipping book you can read.